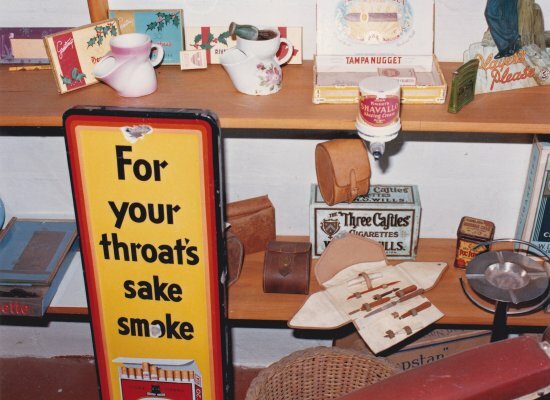 Description Tobacconist Shop: A view of the shelves beneath 1987.006.0095. Objects, tins and packets include: Desert Gold, Riverhead Gold, mustache cups, Tampa Nugget, part of the sailor statue for Player's, Shavalio dispenser, the sign "For your throat's sake smoke Craven A, various leather pouches, The Three Caftles cigarettes, an ashtray, Capstan Navy Cut, a manicure set and a wicker basket. Part of the Brayshaw Park, Beavertown photographic inventory, taken by Roger Thwaites about 1985 (see accession notes).